It is estimated that, in 2017, there were nearly 11 million cases of typhoid and more than 116,000 deaths caused by the disease worldwide. Research shows that the impact of typhoid in developing communities goes beyond physical illness and death. 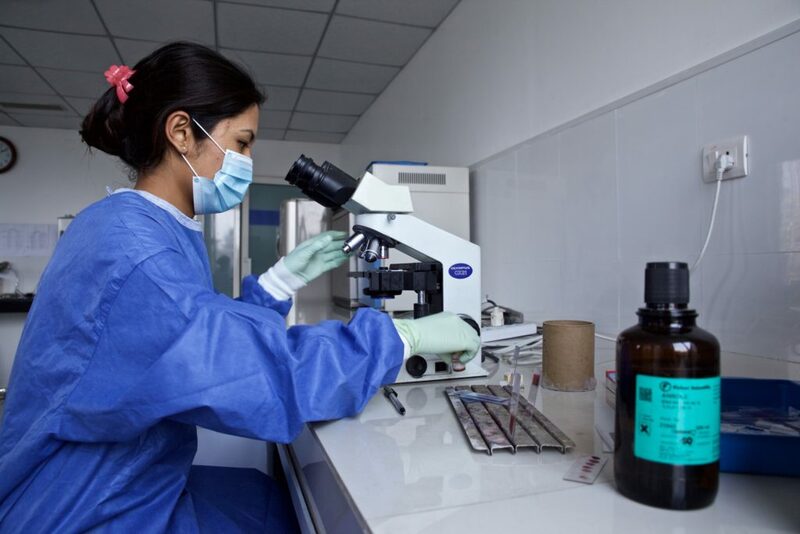 Typhoid infections can cause adverse pregnancy outcomes, impair physical and cognitive development, impact school attendance and performance, and limit productivity in the workforce. Typhoid is a bacterial infection in humans caused by the bacterium Salmonella enterica serotype Typhi (S. Typhi). Humans, once infected with typhoid, carry the bacteria in their bloodstream and intestinal tract, and subsequently shed it in their stool. A person contracts typhoid by consuming food or beverages that have been handled by a person who is shedding S. Typhi, or by drinking or washing food with water that has been tainted by sewage contaminated with S. Typhi. Typhoid is found mostly in countries and communities where many people lack access to clean water and improved sanitation, thereby exposing them to the conditions that enable typhoid to spread. Currently, one-third of the world’s population is at risk of contracting typhoid fever, and the infection remains a very real threat in developing countries. While typhoid fever has more name recognition than paratyphoid, the prevalence of paratyphoid from Salmonella enterica serotype Paratyphi A is increasing in South and Southeast Asia, sub-Saharan Africa, and other parts of the world. The Centers for Disease Control and Prevention (CDC) estimates that 6 million cases of paratyphoid occur each year. Paratyphoid is caused by an infection by the bacterium Salmonella enterica serotype Paratyphi A, B (tartrate negative), or C. Paratyphoid is passed to humans or animals through water and food contamination. Currently, there are no vaccines available to prevent paratyphoid fever, although there are conjugate vaccine candidates under development for paratyphoid fever alone, and as combination vaccines for typhoid and paratyphoid. Nontyphoidal salmonellae are a leading cause of bacterial diarrhea worldwide. According to the CDC, they are estimated to cause 94 million cases of gastroenteritis (vomiting and diarrhea) and 155,000 deaths globally each year. Nontyphoidal Salmonella (NTS) refers to illnesses caused by all serotypes of Salmonella, except for Typhi, Paratyphi A, Paratyphi B (tartrate negative), and Paratyphi C. There are hundreds of NTS serovars that may cause invasive nontyphoidal Salmonella (iNTS) infection in humans; however, Typhimurium and Enteritidis are the most common. These illnesses are not limited to human hosts. iNTS is a major cause of bloodstream infection in sub-Saharan Africa among young children suffering from malaria and malnutrition, and among HIV-positive adults. Much like typhoid and paratyphoid, those with iNTS do not have distinctive symptoms, making proper diagnosis and treatment a challenge. Case fatality from iNTS in African adults and children is 20 to 25 percent. Currently, there are no vaccines for iNTS, but research for a broad-spectrum NTS vaccine is under way. Learn more in recent publications.